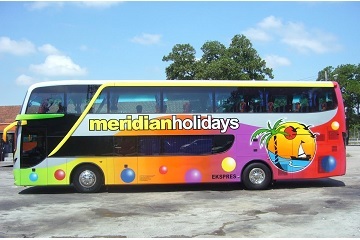 Meridian Holidays is a travel agent which was established in 1989. They started off by providing travel arrangement and tickets reservation services for their customers. In 2009, they have joined the competitive express bus industry by offering 5 daily trips from Hentian Puduraya in Kuala Lumpur to Singapore. 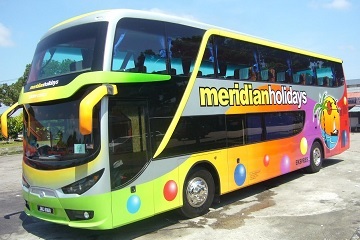 Now, Meridian Holidays is also a bus operator that is based in Skudai, Johor. They operate both express and excursion buses that offer daily bus routes between Singapore and Kuala Lumpur. 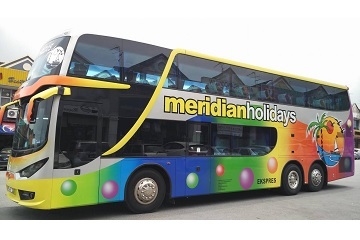 Meridian Holidays provides both single deck and double deck buses. They have different types of single deck bus which equipped with 27 seats, 30 seats and 44 seats. Besides, their double deck buses are equipped with 45 seats and they are using “2+1” seating arrangement for their buses. This spacious design for their buses ensures their passengers to have a comfortable and enjoyable experience throughout the bus trip. The company also paints their express bus in different and vibrant colors to stand apart from competitors. Each time the passengers take a ride with them will get this fresh look and feel. Recently, the company has launched bus route from Terminal Bersepadu Selatan (TBS) to Johor Larkin Terminal and its return route. This bus route has become one of the popular routes offered by them. 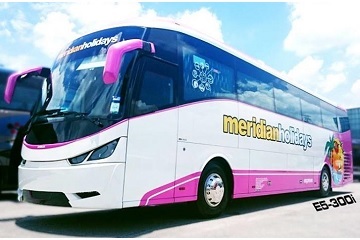 Let’s begin your journey with Meridian Holidays! Book their bus tickets now at Easybook.com.